It’s about time somebody did this. I remember thinking ten years ago that calendars like Outlook got it all wrong. They’re meeting-centric. If you’re not in a meeting, you’re not doing anything as far as your calendar is concerned. I used to block out whole days with appointments with such titles as ACTUALLY DOING S* so I would have time to do exactly that. 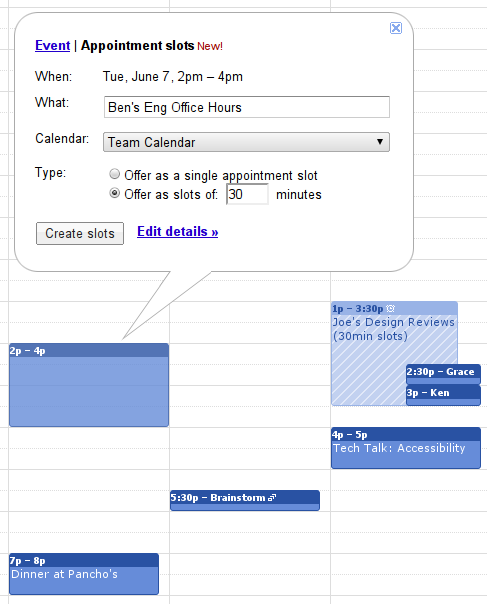 Google Calendar’s new appointment slots is a step in the right direction. It lets you offer up preferred time slots for meetings, much like a college professor’s office hours. I’ll be available for meetings on these days at these times. The rest of the time the assumption is I’ll be doing something more productive. Like working.